This one is a pretty core doctrinal verse. It’s part of the story of Nicodemus, who comes to Jesus asking questions. Jesus teaches him about the necessity of baptism and repentance. At first he doesn’t get it. He thinks of being literally “born again”. But Jesus teaches him that he needs to be baptized and that his heart needs to change. Because it’s such a core doctrine, I gave it “Quote” as its verse rule. This is one that we should all know by heart. It’s icons are wisdom and faith. This is at the core of our doctrinal knowlege and our faith. 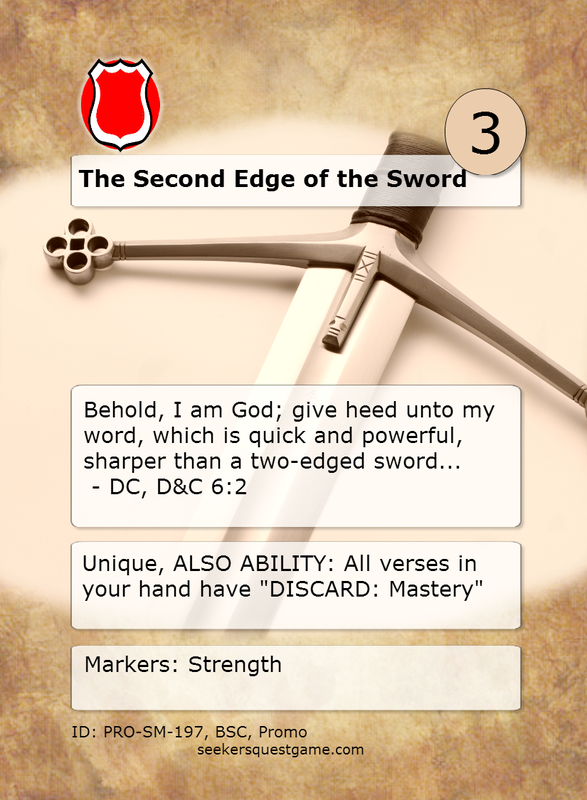 In game, it’s not the strongest card, but the fact that it’s quotable, with two icons can move you forward pretty quickly toward closing a Wisdom or Faith book. Also, there are a number of verses that allow you to set wisdom verses from your hand (like “Clear Sight” or “Revealing” - which also lets you draw a verse). 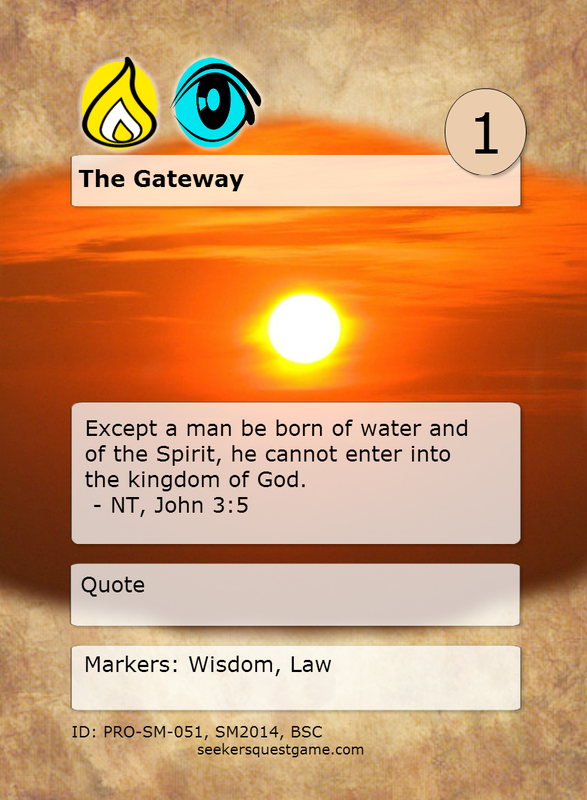 “Treasures of Knowledge” allows you to search your deck for a chosen Wisdom verse, so you could fetch this one, then quote it and play it for free. How to get the most powerful cards in the Game! Today I want to tell you about two special and unique cards for Seeker’s Quest. A long time ago, as I was first formulating my ideas for this game, an image came to my mind, one that would guide me much later in the shaping of the game’s logo. The sword, and the book. 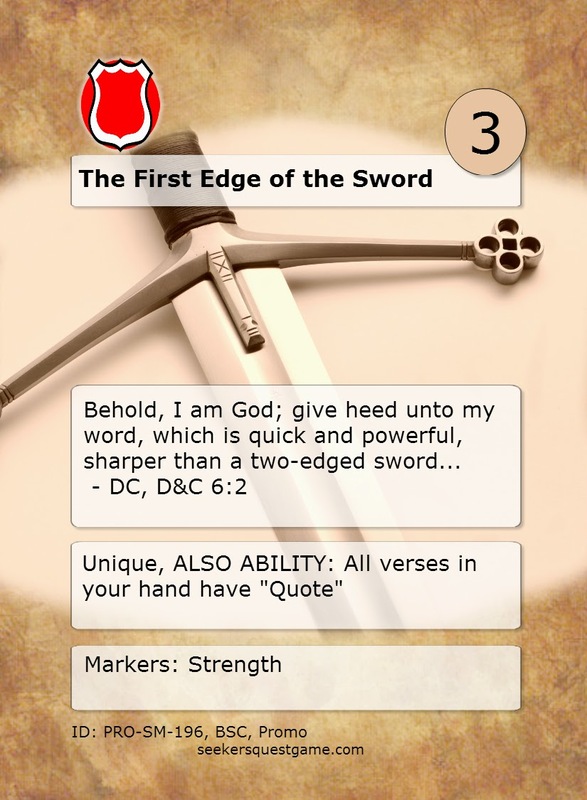 This iconic idea references one of the many scriptures whose essence is: The word of god (the book) is like a two edged sword (the sword - of course). As I researched the idea, I chose Doctrine and Covenants 6:2 as the final exemplar of the concept. They are obviously quite powerful, and both tied into the quoting mechanic. They’re pricey to play, at a sacrifice of 3, and they’re unique, so once they’ve been played once, it can’t be played again. One of them makes it so that you can quote your own verses and play them for free, and the other makes it so that you can force your opponent to quote his own verses or discard them. I’ve played with these verses and against them, and, trust me, they are big, bad cards. But they don’t make a player invincible. Well, I have some of these verses, and I want to share them, but they’re promotional verses only. That means that they’re not included in any of the purchasable sets! So, for a limited time, anyone that buys the Seeker’s Quest Scripture Mastery Set will get one of these promo verses, signed, sent directly from me! The only other way to get one of them will be to get them at a demo or some other face-to-face event. Get the game! Get the sword! You Can Finally Buy the Game! About 8 years ago, I started working on this game. We've developed and tested the cards and the rules, trying to make it the best possible game, so that the players could have a way to have a great time engaging with the scriptures. We went through 11 revisions of the rules, and I can't count how many sets of cards I printed and cut out. But now, all that work has come to a fruition! The Learning Game package is an introduction to the game, with enough cards and rules for 2 players to play, right out of the box.